Well if you haven’t already heard we are expecting our second child. 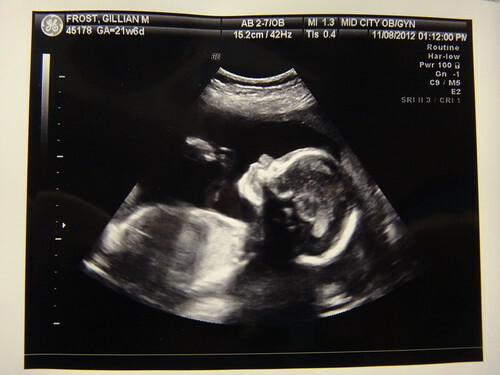 Last Thursday Gillian had her first Ultrasound. We are happy to say that “Baby 2.0” is a healthy baby …boy! I quote, “110% boy”. The most important part is that he is healthy, everything is developing as it should, but I must admit I was a little nervous that I was going to have a house full of girls. Gillian is also doing well, except for a horrible cough she has had for the last few days. No, we have not picked a name yet but now that it is a little more real for me, it was always real for Gillian, I think I will have a easier time coming up with names…or maybe a harder time. This entry was posted on November 10, 2012 at 1:36 pm and is filed under Baby, Family, Parenting. You can follow any responses to this entry through the RSS 2.0 feed. You can leave a response, or trackback from your own site.